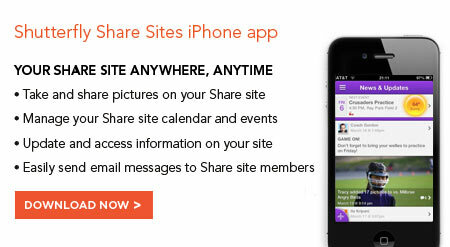 Now access and manage your Team Share site on the go with out NEW Share sites iPhone app. Learn More. Keep coaches and parents organized this season. Share photos privately with other team members all on one site. Set up Team Share sites for all your teams. Upload a spreadsheet with your league data, and Shutterfly automatically creates individual team sites. Shutterfly Team Share sites make it easy to communicate, organize and share photos privately with other team members. You can also manage event schedules, snack duties and player availability all in one place. And it's free. From your team site, you can turn pictures into photo books, gifts and more, but don't to make a purchase. “This was the first time I setup a website as the Team Mom. Shutterfly makes it so easy to add just about anything to the team site.” Robin A. “My hurdle was to finda way for players and parents to view, print and order pictures. Thanks Shutterfly.” Michele C.
“Families appreciatethe one-stop location for game photos, news, upcoming event info and scores.” Ann B.